The DBFZ is represented at a large number of trade fairs and congresses. In addition, we are also organizers of various large events such as the DBFZ Annual Conference, the Forum Science Management, etc. 13. May - 14. 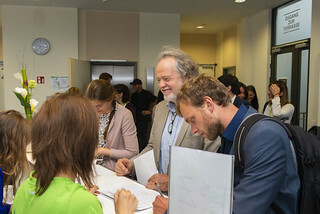 May In keeping with the motto “Bio meets Economy – Science meets Industry”, the two-day event offers interesting lectures on the topics of social-economic issues of the bioeconomy, challenges and chances within the sugar-based bioeconomy, plant productivity for a growing bioeconomy, the pathway to sucess with biotech products and research highlights funded by BMBF. 14. May - 16. May In May 2019, the DBFZ will host the 2nd International Symposium on Hydrothermal Carbonization in Berlin, Germany as a follow-up to the first event that took place in London, UK in April 2017. Organization of the event will be supported by the ATB Leibniz Institute for Agricultural Engineering and Bioeconomy (Potsdam, Germany). 11. Mar - 26. Sep On 26 and 27 September 2019, the DBFZ will host the 5th HTP Expert Forum "Hydrothermal Processes for Material and Energy Value Creation". The forum will focus on the entire value chain of hydrothermal conversion. 30. Sep - 01. Oct The German Bioenergy Doctoral Colloquium aims to bring together the knowledge and decision-makers of tomorrow at an early stage and to achieve better networking of scientific institutions in the field of bioenergy. The second event will take place from September 30th to October 1st at the Friedrich-Alexander-Universität (FAU) in Nuremberg.